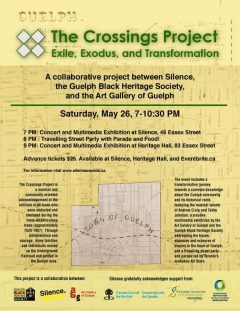 THE CROSSINGS PROJECT was co-created as a community music and multi-media event and performed to a sold-out audience in Guelph on Saturday evening, May 26, 2018. The intention of this endeavour was to tell the story of the trans-Atlantic slave trade (approximately 1526 – 1867) and the subsequent establishment of a Black community in Guelph, Ontario. The local and historical narratives were generated through research, conversations, and workshops from within the Guelph community. Of the millions of Africans who were abducted and enslaved over the centuries, a small portion of families or individuals escaped and traversed to Guelph via the Underground Railroad. In the nineteenth century, a larger community of fugitives arrived in Guelph and built the BME (British Methodist Episcopal) Church, which has stood at 83 Essex Street since 1880. This historic limestone building, now renamed Heritage Hall, housed the finale of this three-part performance. As the audience arrived at Silence, each person was guided into a darkened space by a volunteer. Seats in the space were arranged to face in four directions. Vocalists and instrumentalists were positioned in corners and the centre of the room so that each audience member heard distinctive acoustic elements of the performance. depending on where they had been seated This design and the subsequent ninety-minute soundscape that followed were generated and conducted by Guelph-based musician and composer Andrew Craig, musical director and composer for the Silence portion of the evening (“Exile”). On the recording, an edited version of Act One spans from the opening Village scene to the Escape episode. The music performed at Silence explored the Middle Passage and what occurred after people arrived in the Americas with specific relation to Guelph. Both performance venues are situated in the core part of downtown Guelph where the Black community settled when it first arrived in Guelph in the nineteenth century. Of note in this performance was the use of the Apprehension Engine, a Canadian-designed and built analogue sound generator,/new instrument played by Toronto-based composer Mark Korven. Over the course of the evening, the audience was treated to an impressionistic soundscape composed and conducted by Craig and narrated by renowned singer and actress, Tabby Johnson. The multimedia exhibition (along with educational materials that were distributed to the audience) curated by Cornwall and Hunter was the counterpoint to the concert with important visual artifacts drawn from the local community. Engaging with ideas of artifact and archive, memory and resilience, the exhibition wove together family histories, urban geographies, and layers of community memory spanning time and place, and in so doing visually addressed the traces, absences, and erasures of slavery in the heart of Guelph. When the audience emerged from Silence, they were met by a carnivalesque spectacle parading down Essex St. to the Black Heritage building. The Bahamas Junkanoo Legends, which includes dancers, drummers, and instrumentalists, led the audience in parade-fashion down the street (“Exodus”) from 8 to 9 PM. At a nearby intersection, the group encountered the first of many characters embodied by Tabby Johnson, shapeshifter and storyteller. The track Run Mary Run conveys something of this moment. The audience and parade band then processed further down the street to Heritage Hall. On the steps of the church stood poet Kevin Sutton, portraying one of the historical pastors that served at the BME church. The section on the recording running from We Are Water to I Go offers an edited selection of story, song, poetry, and more generated by Johnson and Sutton inside the Hall. This final chapter (“Transformation”) evoked memories of the past and reflections of the present through stories, improvised sounds, songs, poems, and unexpected interactions among those gathered in the space where the founding members of Guelph’s Black community once congregated. An edited version of the three extended performances that comprise The Crossings Project, conveyed on this recording, begins at Silence. This Guelph-based music and arts space serves as an independent, not-for-profit facility located down the street from Heritage Hall. At dusk, the Silence parking lot presented a video art installation piece curated by The Art Gallery of Guelph, using historical materials uncovered by Kerry-Ann Cornwall of the Guelph Black Heritage Society, who researched archival records about the Black community in Wellington County and beyond. These materials were woven into the voices, images, and characters that came to life during the performance. Andrew Hunter, Senior Curator for The Art Gallery of Guelph, also engaged young artists to contribute. One piece that emerged was a large, felted tapestry made by Noah Brown that hung in Heritage Hall depicting a slave ship. As well, the general public was gifted memorial buttons designed by high school art students and mounted on wood to memorialize the suffering associated with the slave ships.